Starting in 2021, non-EU citizens will be required to obtain travel authorization to enter the Schengen Area. But don’t worry – it’s not a visa, it’s inexpensive and as easy as a 20-minute online application form! Not happy about the changes? We understand. Traveling can already feel daunting at times and even more so with even more bureaucracy to navigate, so let us help you. No, Americans (along with many other countries) still don’t need a visa to travel to Europe Union countries for less than 90 days. Americans, Canadians, New Zealanders, Australians and citizens from roughly 60 other countries will, however, need a special authorization to enter and travel in the Schengen Area. The authorization is called ETIAS and you can apply for it online. If you have a passport of an EU member country, you will not need an ETIAS as long as you travel on that EU passport. What is ETIAS and why do I need it? ETIAS stands for the EU Travel and Authorization System. It is a completely electronic pre-screening and registration process that permits and keeps track of visitors from countries who do not need a visa to enter the Schengen Area. It serves as a way for the European Union to gather information on travelers who currently come to the continent visa-free and strengthen security in across control-free borders. These types of systems are in place to identify security concerns before travel to the Schengen Area and not in the passport control line, thus saving travelers time and hassle. It is also designed to improve border management, prevent irregular or illegal immigration and fight against crime and terrorism. The United States issued a similar travel authorization system called the ESTA shortly after the September 11th terrorist attacks to improve border security and Canada has a version called the eTA. The difference between the ETIAS and the US ESTA is that the latter pre-screens anyone traveling to the United States whereas the ETIAS pre-screens only visa-exempt travelers who wish to enter the Schengen Area. What is the difference between the European Union and the Schengen Area? The European Union is a union between 28 member states in Europe. Note: the EU is not synonymous with “Europe” as a continent. Schengen countries are European countries that have signed the Schengen Agreement. Currently there are 26 countries: all the EU countries except the United Kingdom and Ireland and an addition of Iceland, Norway, Switzerland, and Liechtenstein, which are not EU member states. These countries have no internal border controls between them. The European Union is a political and economic union. The Schengen Agreement allows for the free movement between participating countries. 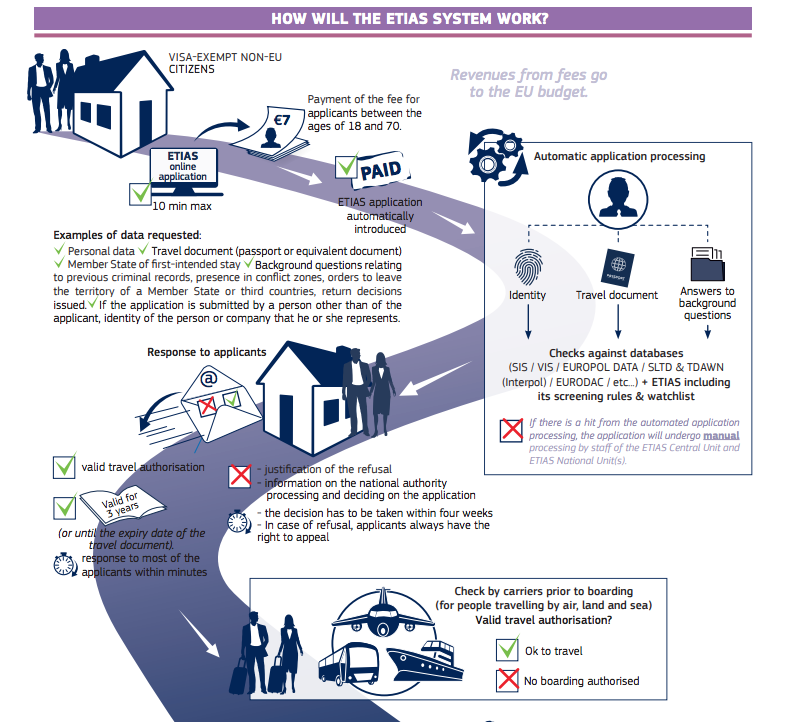 How is ETIAS different from a visa? A visa is a much more complicated process that involves photos, itineraries and financial proof that you can support your travels while abroad. Americans only need a visa to travel in the EU if they are planning to stay longer than 90 days. To compare: the visa process may take months and isn’t guaranteed to end in success. My Italian husband who needed an ESTA travel authorization to travel to the United States filled out the form on his smartphone while at the airport and 15-minutes later was checked-in and on his way to the gate. Though we don’t recommend you book any travel before applying for the ETIAS, it is likely to be a very rapid process that is over in minutes if approved. To apply for an ETIAS travel authorization you’ll need a valid passport that doesn’t expire within three months, a credit or debit card and an email address. The online form allows twenty minutes to fill out the application with basic demographic information as well as your country of entry and contact information. You’ll also have to answer a few background and security questions. Follow the prompts and answer honestly – your application is cross-referenced against European border security and criminal databases. Note that for the ETIAS to work, you have to enter into the country that you stated. Even if your plan is to visit seven different Schengen Area countries, if you state on your application that the first country you will visit is Italy, you must enter Europe through Italy. If there are no problems, then you’ll receive an email with your authorization in minutes. Your ETIAS authorization is valid for three years. After that, you’ll have to go through the process again for a new authorization. They are still implementing parts of the system, gearing up for 2021, but for now you can sign up to receive a notification of when the application process is opened here. You can read more about the ETIAS, including price once it’s decided (it isn’t as of the publishing of this article) at ETIAS: Visa Waiver for Europe or the Schengen Visa Info website. Now that you know how easy it is to get an ETIAS travel authorization, contact us today about our full-service, expertly crafted journeys to Italy!